I find this fascinating. 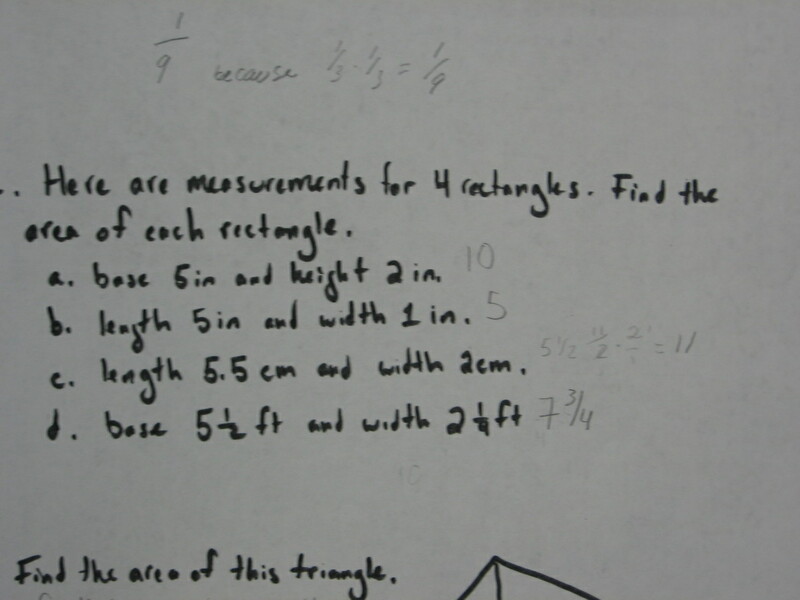 This student clearly knows how that multiplying the base and the height of a rectangle gives you its area. She even knows how to multiply fraction. But when it comes to part (d), she adds the numbers instead of multiplying them. In earlier writing I hypothesized that, when put in unfamiliar situations, students often default to an “easier” operation. This idea now seems problematic to me. What, after all, is an “easier” operation any way? And what exactly would trigger this default to some other operation? And how do we explain why competent adults — like me — make similar mistakes on my own work? It now seems more likely to me that we associate certain pairs of numbers with certain operations. Think about the numbers 100 and 1/2. I’d suggest that most people have an association of “50” with 100 and 1/2. After all, how often have you been asked to add 100 and 1/2 together? How often have you been asked to subtract 1/2 from 100? In contrast, how often have you been asked to find 1/2 of 100? How often have you been asked to multiply 5 1/2 and 2 1/4 together? My guess is that you — and the student above — have been asked to add these sorts of mixed numbers more often than multiply them. The idea here is that the pairs of numbers themselves come with associations. There’s a hard version of this claim that I don’t mean to make. I don’t mean to say that, no matter the context, you’d expect a student to add 5 1/2 and 2 1/4 together. I think a division problem with mixed numbers is unlikely to trigger associations with addition. Maybe I’m moving towards a two-part model? The sorts of mistakes we make with numbers depends both on the associations with the operation and also associations with the numbers? And things get really bad when these two associations point in the same direction? This theory feels very testable, but at the moment I’m having a hard time articulating a possible test of it. But we should be able to mess with people’s associations with numbers and see if that changes the sorts of mistakes that they make. Ideas? Posted in Area, exponents, Fractions, Geometric Measurement and Dimension. Do These Properties Guarantee Congruence? The activity is from a Shell Center task, and the student work is from my own class. We’re missing a few kids, but this is representative of the whole group’s work. What do you notice? Anything interesting? What categories of student responses do you see? 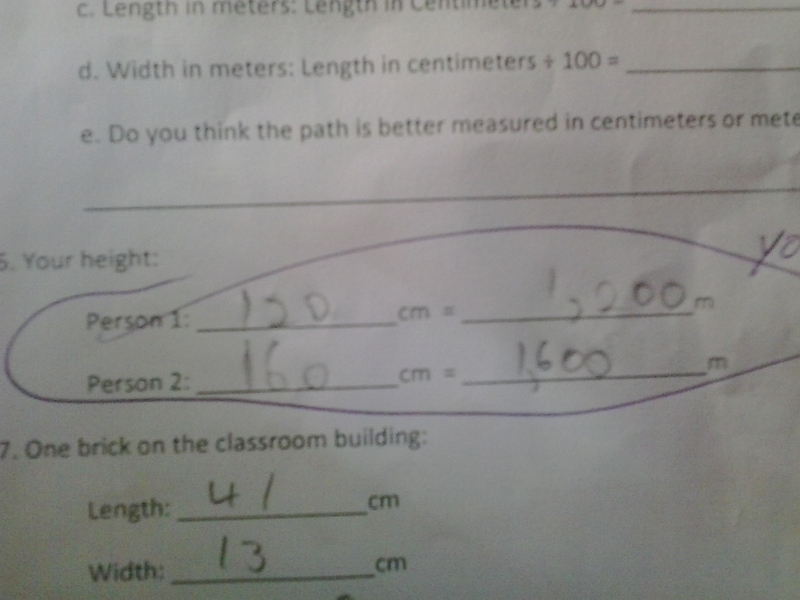 What sort of feedback would you give to push their mathematical thinking further? Posted in Congruence, Congruent Triangles. Comparing Ratios: What Feedback Would You Give? Would you ask a question or make a statement? What written feedback would be most helpful? If you were able to have a conversation with this student, how would you start it? What would the student’s job be once you handed the paper back to him/her? Posted in Feedback, Ratios & Proportional Relationships, Ratios and Proportions. Posted in Geometry, Geometry, Numbers & Operations in Base 10. When I was a kid, a friend asked what my dad does for a living. “He’s a dank,” 18-year old Michael said. What I meant to say was that my dad worked at a bank, but I was distracted or tired and I mixed up the two words. 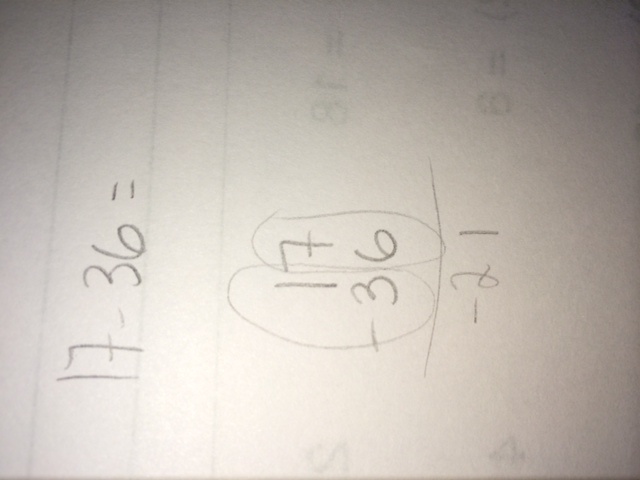 I thought about this while looking through a 3rd grader’s addition work. “He’s a dank” seems a lot like saying “46+30+2=58” to me. I’m not sure what to call this sort of mistake. I’m tempted to call it a memory overload error, but I have no idea if that’s (a) psychologically apt or (b) meaningful to other people. The crucial thing, though, is not to simply disregard these sorts of mistakes as silly errors, or as a sign that the student is lacking some general cognitive skill like “attention to detail” or “being careful with their work.” That would be a bad misdiagnosis. 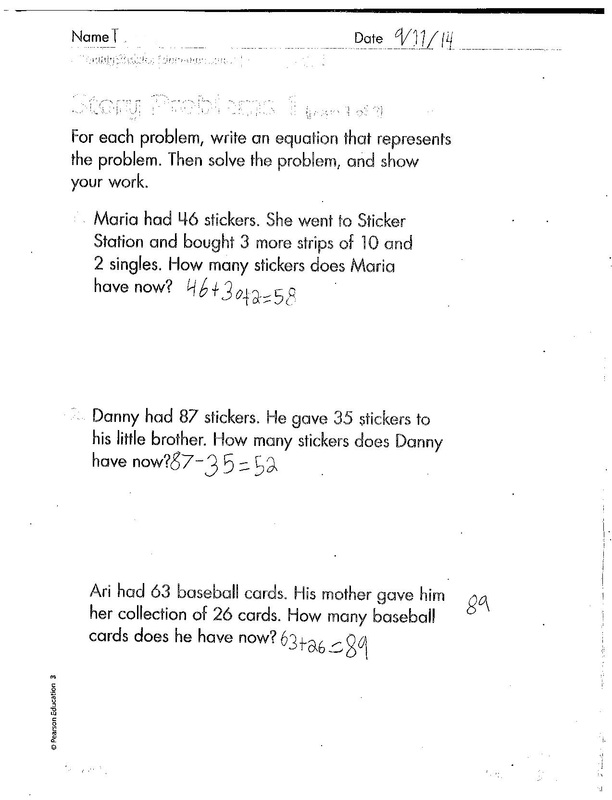 To start building the case for why, pay attention to the “stupid” arithmetic mistakes that adults (and teachers and mathematicians) make while they’re working on a problem. 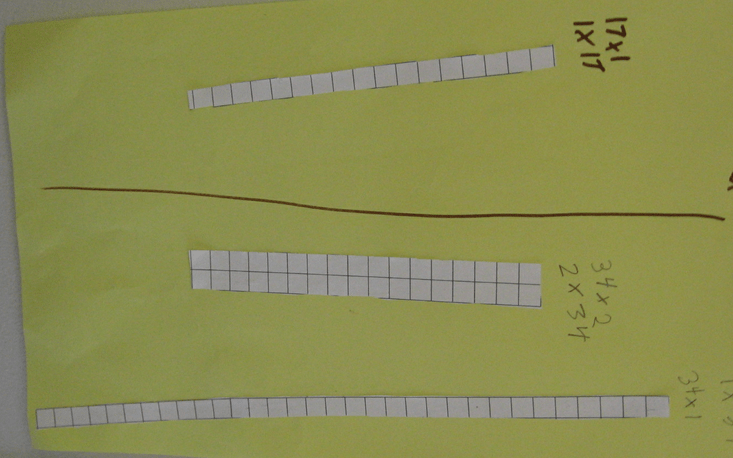 Here’s one I made last summer while trying a matrix multiplication, when I did 1*2+2*3 and ended up with 10. Do I suffer from a general sloppiness in my work? A lack of attention to detail? Nah, I was just distracted by making sure that I kept track of a bunch of others things that weren’t automatic for me. My attention was elsewhere. What causes these sorts of errors? Any sort of distraction, but it’s important not to trivialize distraction. Distraction can come from any number of places. Distraction can come from various non-mathematical things, like friends, chatting, not caring about the problem, etc. Distraction can also come from mathematical factors. If I were better at the matrix multiplication part of matrix multiplication, I would be less likely to mess up some quick arithmetic that I’d otherwise get right. The kid might have been distracted by whatever non-mathematical thing happened to be drawing her attention away at the moment. She might have found keeping track of the tens and ones difficult, and paying attention to the decomposition used up the mental resources that were needed to keep track of everything. She ends up adding 2 and 3 for the tens digit, 6 and 2 for the ones digit. One of the themes of this blog has been a desire to dig deeper than “stupid mistake.” This is one sort of error that teachers often identify as a “silly” mistake, but labeling it as “silly” probably misses out on some truth about a kid’s mathematical thinking. What do memory overload mistakes look like in geometry? In non-computational contexts? What sort of feedback would you give my 3rd grader? Posted in Addition, Numbers & Operations in Base 10. What feedback would you write on this kid’s paper? Why? Posted in Building Functions, Negative Numbers, Sequences and Series, Series, The Real Number System. What’s an example of some feedback that you think a teacher might consider giving, but is not the ideal response? 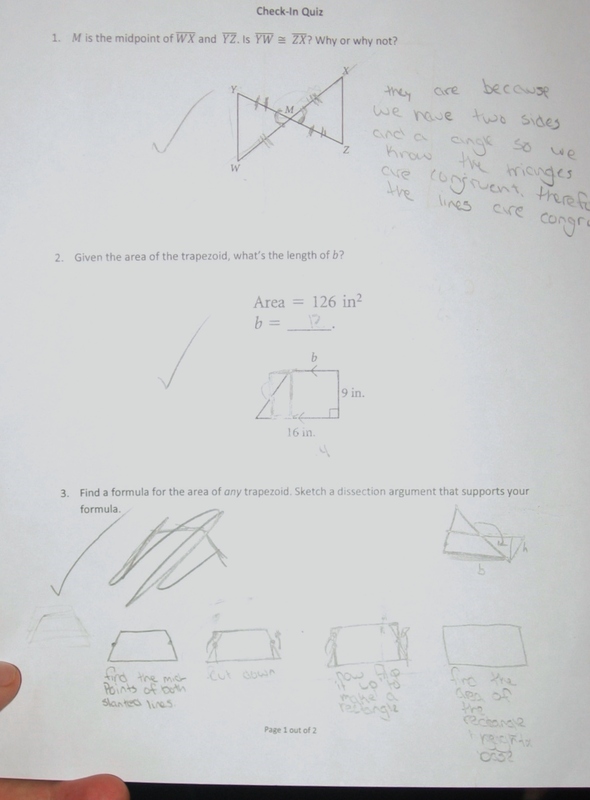 What feedback would you give this student on the page? If you had five minutes to work with this kid one-on-one, what would you talk about? Posted in Converting Units, Measurement & Data. We chatted on twitter about this question for a bit. What predictions can you make about the predictions that were made? Click through to check your answers! How would you give feedback to the students who wrote “infinity”? 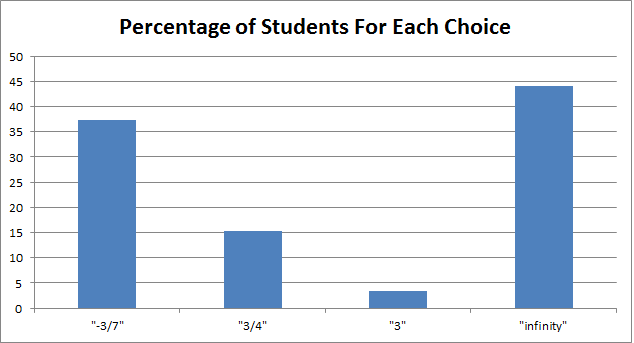 Imagine that you were to give feedback to the students who wrote “-3/7.” What feedback would you give? Posted in Feedback, Infinite Series, Series. 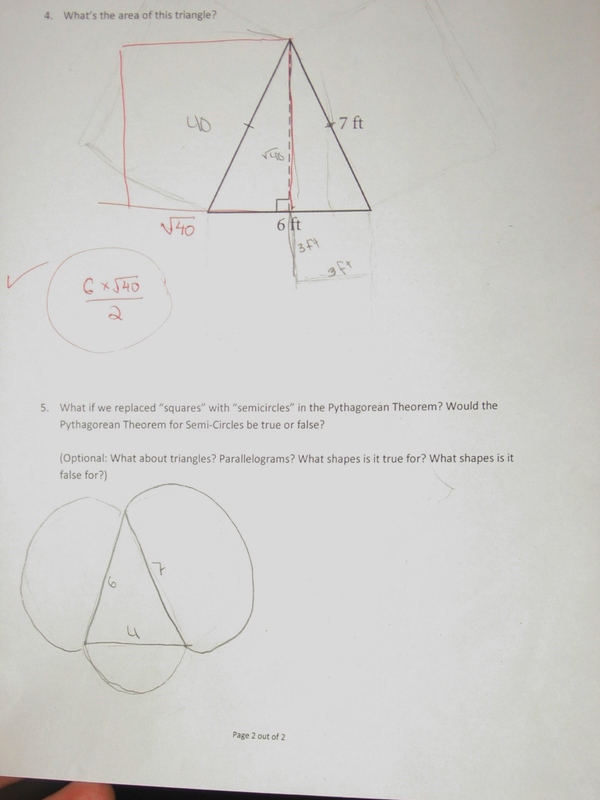 In a previous post, lots of commenters said that they didn’t feel that you could give helpful, written feedback because there wasn’t enough evidence of student thinking on the quiz. 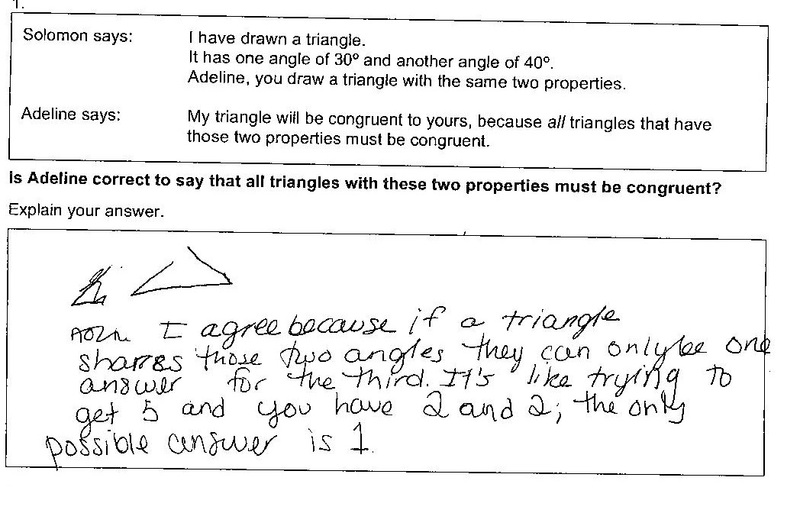 Given that complaint, it might be interested to see how those same teachers would give written feedback on a quiz that gives significantly more evidence of how a student is thinking. Would you give comments on every solution, or only some of them? Will you ask kids to “explain why you said _______”? When is it helpful to ask for an explanation? When isn’t it? Will you give your kids specific next steps, or will you mostly point out the good and the bad of their work? Will you throw up your hands and say “You really need to have a conversation with the kid!” for this sort of quiz also? Posted in Area, Congruence, Feedback, Geometric Measurement and Dimension, Geometry.